To publish a post doesn’t mean you always need to be in front in your computer. Using WordPress, you can simply write a post, schedule it and forget it. 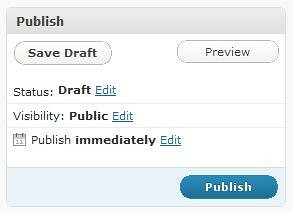 WordPress will then publish your scheduled post at the right time! Write your post as usual. On your right hand side, find the words Publish immediately. Click on the Edit link and change the date and time to any date and time in future. Make sure you click the OK button. Then you will see the blue color Publish button has been changed to Schedule. Press Schedule button once you have done editing your post. That’s it. Your post will be published at the date and time you have set.